Want to get the most out of your smartphone or tablet? Learn how to use Google Now Voice Commands! Google Now is an application that uses a natural language user interface and location-based information to allow smartphones and tablets to answer questions, make recommendations, and perform actions. Google Now Voice Commands includes the ability to issue voice search commands and voice actions. Google voice search allows you to speak into your device to issue web searches. You can search the web for sports scores, movie listings, local business information, maps and directions, and a whole lot more. Google voice actions allow you to issue commands to your device. You can issue commands related to making phone calls or sending messages and more. See the sections below to see how to use Google Now Voice Commands and see a full list of commands. Tap the Google Search Bar Widget on the microphone icon. Perform a long press on the home button. Swipe up on the Google Now icon on the lock screen. While already accessing the Google Now app, say “Google”, followed by your search phrase. Alternatively, some phones allow the Google Now Launcher can be activated by the user uttering the phrase, “OK Google“. Below you will find a comprehensive Google Now Voice Commands list. Have your own favorite Google Voice searches that you would like to share? Post them in the comments section below. If you are looking for Google Home commands, click here. What is Bruce Willis’ full name? Who is married to Amy Adams? What are the dimensions of Mona Lisa? Who is the author of Harry Potter? How do I make really good mashed potatoes? How many seconds are in two years? How many millimeters are in 16 centimeters? What is fifteen percent of thirty-three? What is the square root of twenty two? What is the surface temperature of the Sun? What is twenty plus forty-three divided by one thousand? How much is a British Pound worth? What is the currency used in Brazil? What time zone is Helsinki in? What time does the sun rise tomorrow? Is it sunny outside right now? Will I need an umbrella later? Is it going to snow on Sunday? Do I need a jacket tomorrow in Springfield, IL? What lunar phase is the moon in? Where’s the nearest gas station? Where’s the nearest ATM machine? Where is the closest Starbucks? Show the nearest airport on a map. How far away is New York City? How do I get to Dodger Stadium for my location? What is the National Anthem of Russia? Has Southwest Flight 595 landed yet? What is the status of United Flight 001? How do you say “thank you” in Hebrew? What’s a good sushi place around here? What is the best pizza restaurant in Los Angeles? What are the business hours for Trader Joe’s? When is the next Broncos game? What’s the score of the Dodgers game? How much does Vince Wilfork weigh? How many championships has Phil Jackson won? What’s the theme song from the opening credits of House? When was The Green Mile made? Name the original cast of Star Trek. Who was the producer for Breaking Bad? When was the first episode of That 70’s Show? What movies has Christian Bale been in? What are the showtimes for Cloudy With a Chance of Meatballs 2? What were the stock numbers for NASDAQ today? 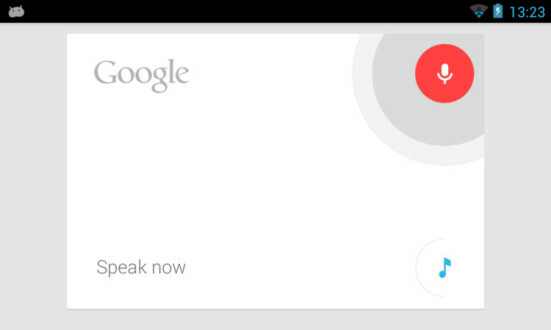 Know of any cool and useful OK Google Now Voice Commands not listed above? Come up with and clever “OK Google” launch phrase alternatives? Share them with us in the comments section below. Also, check out the Google Now Voice Commands video for additional tips on how to use Google Voice Search. Nice information .thanks for posting.